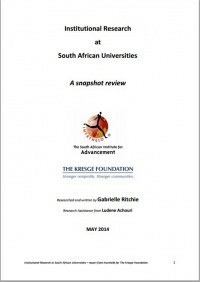 This study, funded by The Kresge Foundation and conducted by Inyathelo, provides a snapshot of Institutional Research (IR) operations at South African universities. The purpose of the study is to provide preliminary insight into institutional practice with regard to Institutional Research and its relationship to institutional planning, academic development, student support services and student success. Enter your details to access your free download.